For most people a weekend getaway to the stunning Tsitsikamma town of Storms River signifies a romantic dwell in the forest - wooden cabins, picnics in dappled sunlight and indulging in the naturally good things in life. Tranquility in the form of bird sounds, shades of green, brown and hints of sky-blue. However, what many may not know is that Storms River has a whole other side to it. Not a dark side, but rather a whimsical mixture of bright neon, checkerboard black-and-white, bottle blond, lime milkshake, shiny leather red and hints of slick gold. Basically, take a wrong turn, neglect to leave your bread crumb trail back to the forest cottage behind, and you may just find yourself hopelessly lost in the ‘50s! Yes, it may come as a quite surprise, but since the inception of Africa's first and only Elvis Festival last year, Storms River has experienced a retro revival like you wouldn't believe! 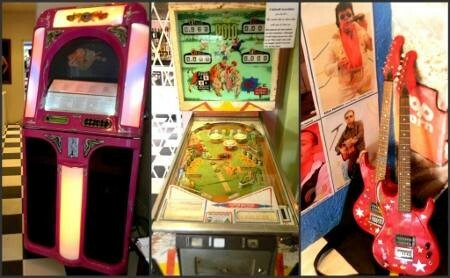 It all started when Jan du Rand, life-long Elvis fan, sometimes impersonator and former owner of the Tsitsikamma Village Hotel, came up with the idea of creating a platform for fellow die-hard admirers of the king to live out their 1950s fantasies. Along with his wife, Ann, Jan started piecing together plans for a festival that would rock the drabbest jailhouse and get the dustiest of blue-suede shoes a-dancing. 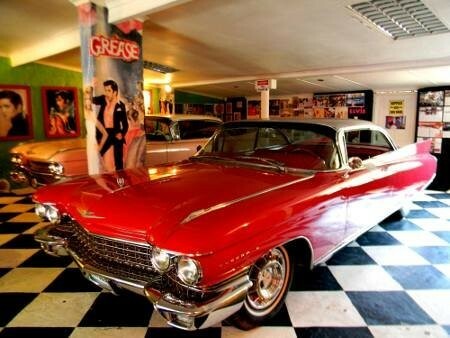 By this time the scene had already been somewhat set in the form of the fanciful Cadillac Shack, a jazzed up quadruple garage housing the Du Rands' collection of vintage cars, a jukebox or two and an assortment of Elvis, Marilyn and James Dean paraphernalia. However, it was only opened to the public on special request and stood curtained up and blacked out more often than not. Well, that's what it was like the last time I visited - perhaps a week or two before the Elvis Festival 2010 kicked off. Now, a bit more than a year down the line, the street the Cadillac Shack once quietly and unobtrusively watched over from its veiled vantage point has exploded into a firework display of sunset pink, deep purple and electric turquoise. 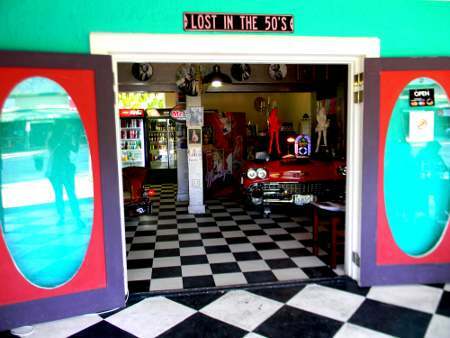 Instead of drawn curtains, the doors are thrown open wide and interleading rooms guide one to the neighbouring Marilyn's Diner and Rock ‘n Roll Store, a suave soft serve, sweet an souvenir shop. And above the entrance, in bright neon lights, its new name blinks: Chrome and Fin City. "After 30 years, Jan finally decided to sell the Tsitsikamma Village Hotel sometime last year, and so we decided to open Marilyn's Diner in December. I mean, after all, what's a girl to do in a quiet town like this?" Ann explained. She added that Jan's collection of ten classic cars - of which four are always on display at the diner - is still a huge tourist attraction, and that this year's Elvis Festival Africa was even more spectacular than the one before. 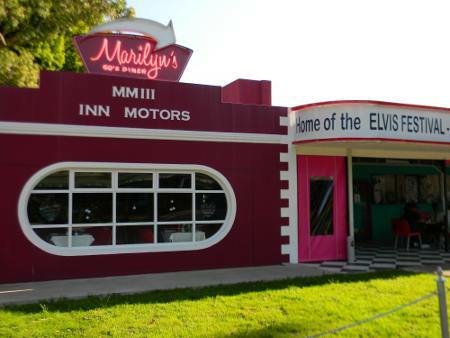 "We were initially quite worried that foreign tourists would snub the diner, looking for something more ‘authentic,' but were so surprised to find that Elvis is and probably will always be a household name and a legend right across the world," Ann confessed. Since the day the diner opened, Ann has been living out her passion for the revival of all those almost forgotten goodies of yesteryear - banana split, chocolate cigarettes, and apricot sweets. "There is such nostalgia in dishes like banana split! In fact, my sister and I traversed the whole of Cape Town's second-hand sales to find the most suitable and ‘romantic' glassware to serve them in!" It seems like these small touches - along with the bright and bold ones - have proved to be a recipe for success, as people keep people coming back for more and are steadily spreading the word. So, if your travels are taking you along the Garden Route and up to the Eastern Cape sometime soon, make sure you take a sho't left into Storms River to experience a good and solid blast from the past. 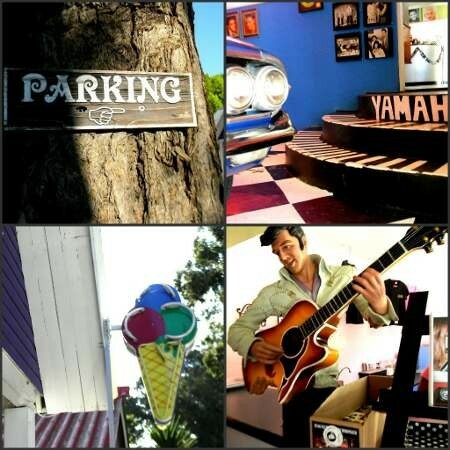 The diner is open every day from 10:00 till late, and from 08:00 till late on public holidays. Big Elvis fan? Make a big red entry in your diary for Elvis Festival Africa 2012, taking place from 21 - 23 September next year. This time round the theme will be ‘Elvis Meets his Friends,' to bring the likes of Roy Orbison, Diana Ross, Frank Sinatra,Rod Stewart, Grease en baie ander 50 and 60's legends to the stage as well. Click here for Marilyn's Diner's contact details and more photos.